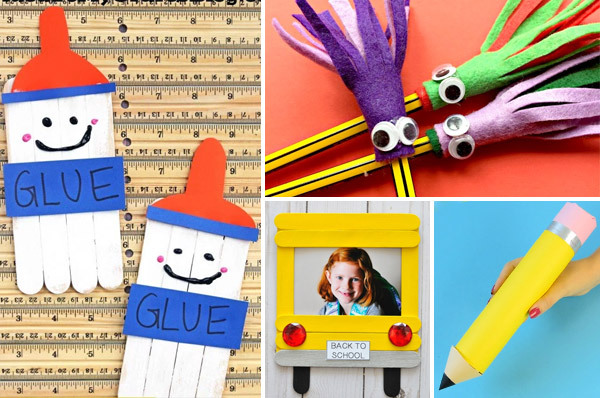 The end of summer might be getting closer, but there is still time to enjoy some fun summer activities, as well as start thinking about back to school with these awesome August crafts for kids. These August crafts for kids are so much fun! 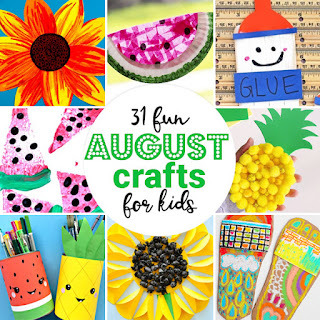 There is enough craft ideas on this list for you to try a new craft every day in August and something for everyone to enjoy! Celebrate the end of summer with some gorgeous sunflower crafts, make some watermelon crafts, and try some fun back to school crafts. There is also lots of other great end of summer and August crafts for kids to make and enjoy. Sunflower craft with oil pastels from Project With Kids Have a go at making this gorgeous sunflower art with easy to follow steps and a printable template. Black glue sunflower craft from Schooling and Monkey. You could make a whole field of these sunflowers for the wall! Egg carton sunflowers from Buggy and Buddy. Transform an egg carton into a sunflower! 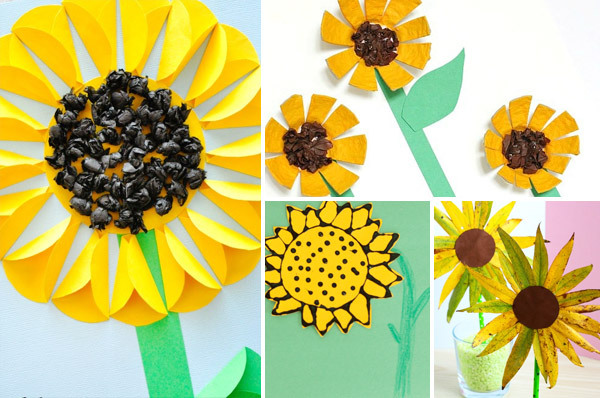 Leaf sunflower craft from Easy Peasy and Fun. These gorgeous flowers are made out of leaves! Paper plate sunflower from Happy Hooligans. This is an easy craft that is perfect for little hands. Simple sunflower craft from 123 Homeschool 4 Me I love that this sunflower craft uses real sunflower seeds. Folded paper sunflower from I Heart Crafty Things. This is such a clever way to make a sunflower. Watermelon God’s eye weaving from Red Ted Art. This is a fun craft for older kids and there is a great video to show you how to make them. 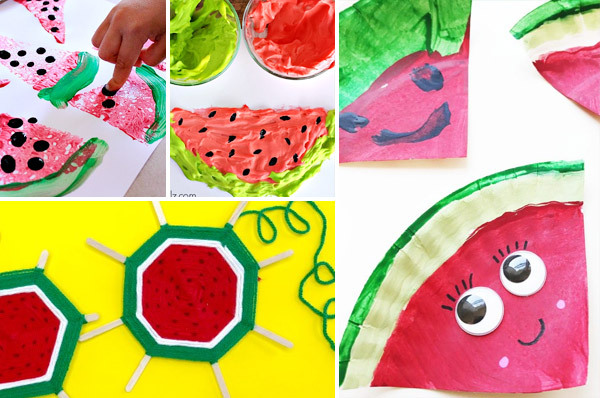 Paper plate watermelon craft from The Art Kit. How cute are these little slices of watermelon! Watermelon sponge painting from Fantastic Fun and Learning. This painting activity is a gorgeous way to celebrate summer. Puffy paint watermelon craft from Crafty Morning. What a fun way to paint watermelons, and there is a DIY puffy paint recipe to try too. Fruity paper plate envelopes from My Poppet Send some mail in one of these cute watermelon envelopes! Watermelon pinwheel craft from Kids Craft Room. There is great step by step photos and a video to help you make this fun craft. Watermelon suncatchers from Kids Activity Blog. These would make a gorgeous window display. Paper roll pencil craft from Easy Peasy and Fun. How fun is this giant pencil!?! Countdown to school craft from Preschool Inspirations. What a fun way to count the days till school starts! Back to school photo frame from I Heart Crafty Things. This is such a cute craft stick project. Easy origami school bus from Pink Stripey Socks. An easy origami tutorial that you can personalize with some art! Monster pencil toppers from Red Ted Art. Make some of these cute monster pencils to celebrate back to school. Pool noodle pencil from Lalymom. This giant pencil really writes! Popsicle stick glue bottle friends craft from Glued to My Crafts How cute are these little guys?!? Monarch butterfly symmetry craft from Buggy and Buddy Celebrate the monarch butterfly migration with this gorgeous craft and practice some math concepts too. Pom pom pineapple from My Poppet. Another delicious summer fruit is pineapple, and this pineapple craft is gorgeous! Summer Pencil holders from Red Ted Art. 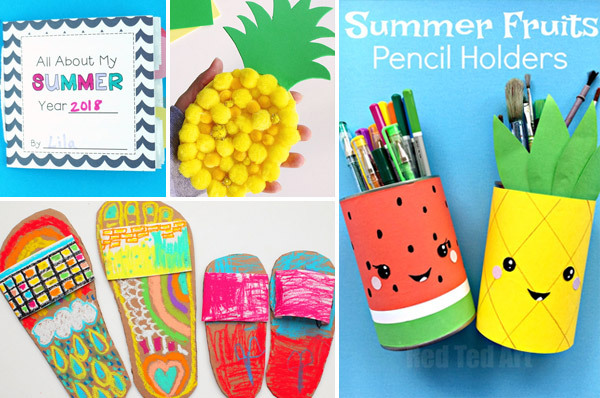 Make these summer fruit pencil holders to celebrate back to school! Free printable crab hats from Kids Craft Room. If you’ve got time for one more trip to the beach this summer, you should definitely make a crab hat to wear! Colorful flip flop art from Pink Stripey Socks. This is such a bright and colorful art activity! DIY paper fan craft from Red Ted Art Is it still hot where you live? Cool off with one of these fans. Egg carton turtle craft from Frugal Fun for Boys and Girls. Sea turtles are laying eggs in some places at this time of, and these little egg carton turtles are a great craft for learning about them. Paper plate turtle craft from Fireflies and Mudpies. There is a printable template to help you make this cute turtle! Flower crowns and necklaces from The Artful Parent. Celebrate the end of summer with a crown! Paper bag summer memory book from I Heart Crafty Things What a lovely way to capture summer memories, and there are some great printables to make this project even easier. 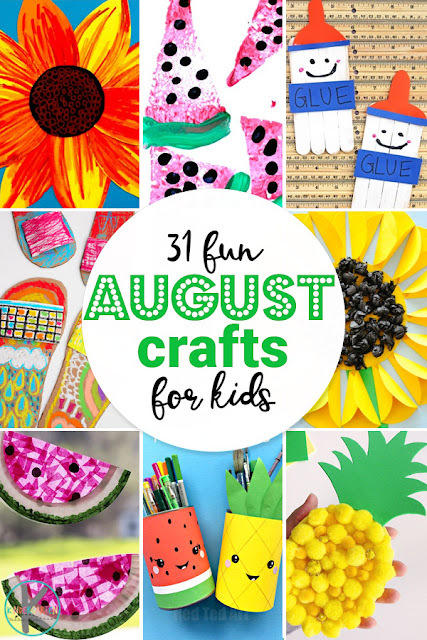 You’ll be busy all month long making these 31 fun August crafts for kids!